Today I delivered two sessions for classes of students doings PGCE. Their class is on an evening from 5-9pm. The plan was to show them how to access the e-book collections that we have which are e-brary and dawsonera and then to show them e-journals through especially infotrac. The first group were a bit disinterested at first but got into it - we didn't have much time, only half an hour as they had to go to another presentation. The second class were more enthusiastic and also more bolshie. I've discovered this when doing the sessions with similar classes when showing them the interactive whiteboard voting systems - to start with disinterested and don't want to spend the time finding out about technology but then get more engaged and ask loads of questions. So we looked at dawsonera then ebrary - they liked the part where you can copy and paste and it brings the referencing details with it (timesaving). Looked at infotrac for journal articles etc. Tried to emphasise the point of investing time in searching for quality information - may have had some success. The pile of paperwork in my office has reached critical level so I'm spending an hour or so tidying it up, filing it away and hopefully throwing some of it away. It is inevitable that there is still a lot of paper around - lots of processes are still paperbased within the college and external e.g. Invoices, meeting agendas and minutes, leaflets for events. But I have the habit of dumping them in a pile and once the pile gets too big, I sort it out. Not the best method and not as efficient as my electronic methods but it's a system of sorts. My office is small but quite nice. It is in the middle of the LRC so surrounded by activity and noise but I can close the door if need be. If there are more than 3 people in here it is crowded! The tutor for a group of 7 Skills for Life learners asked if I would do a session using the Wii as part of a unit they are doing about healthy living and exercise. They could take photos and use this as evidence. I set up the Wii to display on the interactive whiteboard and set up two controllers. It is easy to set up the Wii with the IWB – it now only takes me about 5mins from out of the box to ready to play. I decided that we would start with bowling as I knew from previous experience that this was the game that these students liked best and that they found the most enjoyable and manageable. The students are quite happy to take it in turns so the controllers just get passed to the next person in line once you have had a go. Therefore the score is not really important and they are not particularly competitive with each other. They are good at encouraging each other and the good thing about the bowling is that they all find it relatively easy. The action needed with the controller seems to be relatively easy – I don’t know how much of this is ‘prior experience’ and how much is inherent in the action. Next we played baseball which they also enjoyed. I suggested this but said that I wasn’t sure how it worked and that we would have to give it a try. They seemed happy with this and weren’t unnerved by the fact that we weren’t sure how the scoring worked. This game meant that they had to work together as one person had to ‘throw’ and the other ‘hit’. They soon got the hang of it and didn’t seem to mind whether they were a hitter or thrower. The action was still relatively easy to do. Tennis was next on the list – again most of them had played it before and knew the basics. The scoring was ok and prompted discussion. They enjoyed it but didn't think it was the best game. We then played darts which I have done previously with some other groups of students for numeracy. On this occasion with these students it wasn’t particularly successful for a number of reasons. The controller is held in a different way and the action of throwing is different. It requires two actions – one to place the target and then one to fire the dart. It is very difficult to be accurate and also for these students any benefits of the numeracy theme were not worthwhile. The good thing about it was they discussed it lots and really tried to help each other although they got a bit frustrated or lost interest in the end. The whole session was good fun – they enjoyed it and I did too. The main point to remember I have found when using the Wii is that some games / activities work better than others – nearly all groups enjoy the bowling so it is a safe bet although can be time consuming if they don’t want to share. Some games are much more difficult than others e.g. air hockey, darts. Sometimes it is a nice surprise when a particular game appeals to a variety of learners e.g. shuffleboard. This morning I did two 'quick' inductions for groups of ESOL students. These groups have quite good English as I think they are here on teaching placements. The quick version means that we have to rattle through the essentials in half the time - logging on to the system, logging onto Blackboard, accessing emails and setting up print accounts. At least it means that they can access the college system and resources. We practiced our presentation for curriculum liaison sessions on Friday. Not sure how it will go - I have persuaded our team to go along and departments to have us so it may work. This afternoon we had two librarians from Teesside University come to visit - had a good chat comparing the way things are done at each institution and how they link. Took them on tour of LRC and of the College. Today we hosted the RSC Northern e-Learning meeting. There were 16 attendees from around the region mainly from FE Colleges. I was proposed as chair of the group. It is a good group and we had a number of interesting discussions including one about e-safety and social networking. Most colleges including ourselves include e-safety in their induction programmes for students and emphasize the need to be responsible and stay safe online. As far as using Facebook is concerned, I was surprised to find that all other Colleges block its use. This is due to the scarcity of resources ie computers so they are needed for work at all times and also because it is felt that it is not a suitable site fir students to be on as it us equivalent to playing on computer games. I think we have a lenient approach but I'm not sure whether it us right or not. Students get distracted from working and it creates a social rather than learning environment. Also does it conflict with our duty of care to students. We had a round the table round the region discussion about the latest developments in each institution. I really like this part as it's interesting to know what is happening in other colleges. There are a lot of new Principals about - ours, Bishop Auckland, East Durham, Darlington - it means change and in some cases redundancies which is very hard. James and Richard delivered a presentation about online assessment in Blackboard and the batch feedback upload tool. It went very well. There are a few events coming up in the region including an e- responsibility conference which I am interested in going to. Next meeting is in March. 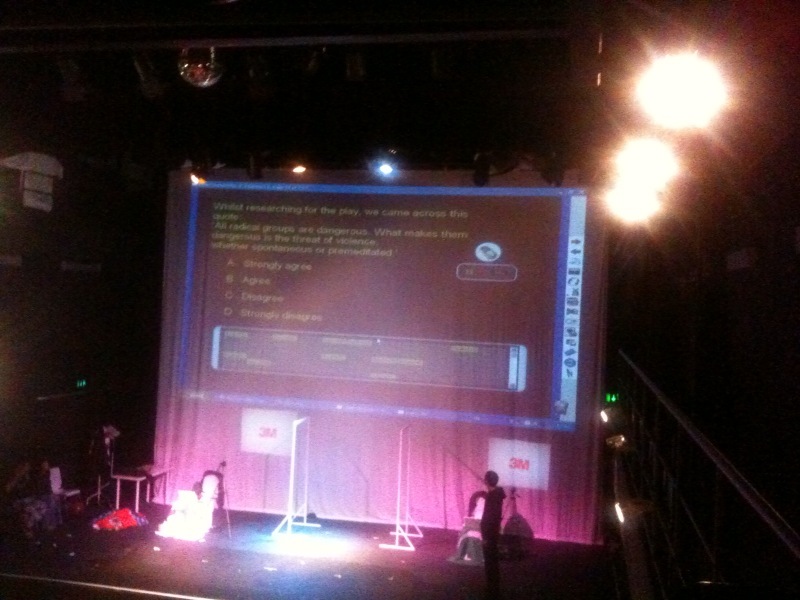 Over the last few weeks I've been helping set up the IWB voting system as part of a theatre production in college. In our VPA dept a group of students and lecturers have created a performance to look at the Prevent Agenda and radicalisation especially in the North East. It is a powerful production and you can see a trailer for it at the link below. The small part that I've helped with is setting up flip charts which project onto the screen at the back of the stage showing a series of questions about the play and it's characters. The play stops at various points and the audience are asked the questions. The members of the audience have been given an Activexpression voting handset with which they select their answer and vote. The results are displayed on the stage screen. The questions are opinions about the play and radicalisation. We managed to set up 97 handsets (out of 100) to the one hub which ran from a laptop at the back of the theatre. It worked really well and gave instant feedback which could be discussed as part of the performance. Also in one scene the actors used laptops on the stage with mini projectors which projected their screens onto a small part of the main screen - it was an interesting effect, a visual representation of a variety of activities simultaneously. It was fun to help out and valuable from an e-Learning point of view as it showed the use of classroom technology in a non classroom setting. It has given us ideas of how to use the voting sets with a large audience and how to integrate the results into a bigger picture. Today I attended the Teaching & Learning Director of Programmes meeting. It's usually quite interesting as lots of discussions and strong personalities. It gives me an important insight into the curriculum and teaching eg observations, teaching squares etc. Today I wanted to talk to them and get support for the idea of improving our LRC curriculum liaison role and creating greater awareness of what the learning resources department can do for them. We have a member of staff who is connected to each department SMS it is their role to ensure that teaching staff know about new resources and books that are available and how to access them, to check out reading lists and generally build up a relationship. This year my target is to strengthen the role by delivering awareness sessions - basically "What we can do for you" and "What do you want from us" and at the end of the year "Is what we do effective". It went down quite well - some departments wanted the session as a whole dept presentation others thought it should be focused on course teams so more dedicated to courses. Now I just have to set some dates and plan the sessions with the team. I took along netbooks with the meeting papers on in order to encourage partcipants to be paperless. Some members bring along laptops but in order for everyone to use the electronic copies of the papers I take them too. The chair of the meeting uses the IWB to display the papers so that people can view them easily. I think it only works if you have the information available on the IWB plus on laptops / netbooks ready for use. Today was the first meeting this year of our E-learning & ICT Strategy Group meeting. It is attended by Assistant Principals, Directors of Programmes and other interested parties. It is co-chaired by myself and the Assistant Principal for Information Services - we take it in turns and it was my turn today. The meeting works well as an opportunity to discuss the strategic development of IT and e-learning across the College and to make recommendations for the roll out of new hardware and software and projects. We aim to have curriculum involvement and business support involvement to ensure a cross college interest. Discussed e-learning plans, Blackboard issues / situation, Turnitin, developments including Bb9, Windows 7 , Office 2010 and SharePoint for the staff Intranet. It is important that we remember that the purpose is strategic and we don't get 'bogged down' discussing operational activities e.g. how many new PCs have been installed. We have a variety of other groups that feed into this main strategy group i.e. Blackboard User Group, IT User Forum, LRC User Group. I attended the ALT conference last week - it was held at East Midlands Conference Centre, Nottingham University Park. This is a really nice venue, compact building but actual rooms are a good size especially the main hall. I prefer it to both Leeds and Manchester. The conference lasted for 3 days (at least) but i was only able to attend for the one day i.e. Wed (more about this later maybe). The next session I attended was the one I was chairing entitled Learning Environments. There were two presentations. The first by Trevor Barker was about using Second Life with his computing students. It was really interesting and I liked it because it was about using Second Life with actual whole classes of students as part of their course and not just creating a Virtual world for no reason (made me miss teaching ICT). It was used as a tool for real life skills which can be transferable. The students created a program in real life then played it in the virtual world. The second presentation was by Steven Verjans and was interesting too and focused on learning needs across all aspects of life - institutional needs, cross sectoral needs, individual learning need v organisational. I enjoyed chairing the session and would like to do it again. I then went to the session about Changing Staff Development. One presentation was about Heads of e-Learning and their personal growth and feelings of being imposters???? i understood the theory possibly but I have to say that it has never crossed my mind to think of myself as an imposter - this is not meant to an arrogant attitude - but just that a) I think I do my job quite well b) it doesn't matter what your title is as long as you can perform effectively and c) someone would soon tell me if I wasn't doing a good job. I accept that this may be a FE focused attitude but realistic. The next presentation included some valid points about the problems of teaching students from Net Generation the basic ICT skills. I then stayed in the main hall for the talks by Josie Taylor and Heather Fry which were very informative. Next came the ALT AGM which has quite an upbeat feel for an AGM and I find very interesting. I think it must be because of the people involved and I like being involved too. Unfortunately I then had to set off to drive home. The training room has always been cold but has recently got so cold that staff won't sit in there for an hour. Today, finally, a fault was tracked down ( yes, it is actually cold air not warm air)......hopefully this means that it will be fixed soon. Meanwhile we have had a challenging day with Windows7 / Office2010 - a nice variety of error messages but still hopeful to get it working by next week. Planning the student LRC / IT inductions which begin next week. The format is going to be much the same as last year as it was quite successful. The sessions are practical 'hands on' hour long sessions as this suits our learners, and staff, best. e-brary have proved very popular. We set up their printer accounts and show them how to use the MFDs (networked printers, scanners and copiers). This year we are adding an e-Safety part to the inductions in order to ensure students have some awareness of e-Safety issues. Last year we delivered inductions to nearly 3000 students - this year we are hoping to do even more. It is a very busy time for us and it is quite labour intensive as it takes a lot of staff time and effort but it is definitely worth it. By making sure the students have the skills they need to access all the various college systems and resources in the first few weeks, it means that they have less problems during the year and can make the most of the learning experience. It has been a long day but successful. I am the last one here in the LRC manning the desk and it is wonderfuly quiet after the hurly burly of the day. Back to work today and lots of staff back too. Feels like the beginning of the year. Spent time planning staffing for next year - a new e-Learning technologist is needed. Windows 7 and Office 2010 have been installed in the staff training room as a trial - still some problems but hopefully these will be sorted out soon. Attended the ALT FE committee meeting in Birmingham. It was held at the Aston Business School which is quite nice and walking distance from the train station. The meeting is interesting as there are a variety of topics discussed and the members of the group are knowledgeable. Also it is an opportunity to look at how learning technologies are used in FE from a different angle, a strategic angle maybe but moreso an organisational angle. Discussion about how to increase awareness of the committee to institutional representatives so their input could be included. Half term week in the LRC - quiet, not many students about so a good opportunity to catch up. Today we demonstrated the 3D Amazing Interactives software system that we have purchased. It was set up in The Street (main reception area in College). Quite a few people came along to have a look - students & staff. The best parts are the body / heart, the aeroplanes / ships and definitely the supermarket. Still busy in the LRC this week with lots of students hard at work. There are deadlines for assignments so this tends to give a different feel to the place & space. More focused and less movement - students tend to come in and stay in for longer. Also more tutors keeping an eye on students to make sure they finish their work in time. I covered the desk over lunchtime as we had a couple of staff off. Yesterday we successfully set up a Nintendo Wii with the Interactive Whiteboard in the training room. We also tried it in the Quiet Study & PC room (although this may not fit in with the ethos of quiet study) and it worked well including the sound. We now have to have a plan as to how and why we are going to use it with the students. Everyone is thinking of ideas for Wii games that would be suitable - probably along the lines of numeracy, thinking skills, co-ordination, health & exercise. There are a few case studies that I'm looking at too. I would like to try and find out whether it is possible to have some interactivity of the board with the pen in addition to the Wii game. Today I'm on the counter covering lunchtime as we have a member of staff off sick. I have spent this morning looking at budget figures so it makes a nice change. Some workmen have come to put a blind up at the window of the prayer room. The prayer room looks nice since it was decorated at half term however we are still waiting for some information about the room and the chaplains that we can pass on to students. The LRC is quite busy with most students quietly getting on with work either at PCs or at study tables. We haven't had any major problems today although we are still getting a few 'No Communications' messgaes on the PCs. This is when the PCs lose their connection to the network so we have to book them back on to the PC. It is a long standing issue that we are monitoring. We've had a relatively good start to the new term. We started back on Monday 4th Jan and stayed open everyday despite the snow and bad weather conditions. Friday evening - we're open until 5.30pm so just tidying up after the last students have left. We have had a relatively calm week as far as students are concerned. This is good as we still have staff off sick and one person off on jury service. We have been looking at different Library Management systems to see whether we can replace our current one which is Autolib. We had a demonstration of Liberty this morning which looked good and seems that it has the functionality that we need.